When I first switched from commercial to fine art, I tended to paint with almost painstaking attention to detail. I used fine brushes and painted leaves on shrubbery in forest landscapes or feathers on portraits of birds. It was a hangover from my days working as an illustrator. My style has evolved over the last decade, with small breakthroughs in technique occurring every couple of years. It's taken me a long time to loosen up but the last year has seen me become more comfortable with producing loose-looking brushwork. I switched to using chisel-edged, flat synthetic brushes about a year ago. I'd discovered such a brush that I'd owned for years but never used. I tried it, liked it and bought a few more. I've rarely touched my old bristle brushes since (and several of them should probably be binned anyway). I mention all this because I was speaking to a friend last night who was giving me her assessment of some of my work. The paintings that really caught her eye were the more expressive ones, with loose brushwork. She felt they had more "personality" – a bit more of "me". 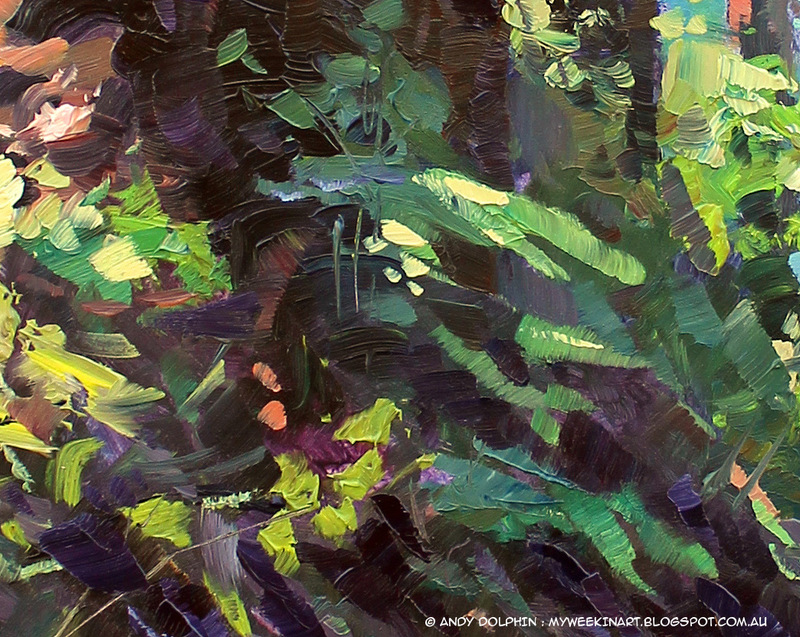 With that in mind, I thought I'd post a close-up of the karri tree painting I did last week. Here's some of the brushwork in the shrubbery at the base of the main tree. Those almost-horizontal green strokes near the centre represent bracken ferns. Ten years ago I would have spent hours just on them, while these ferns took mere seconds to paint and, for a painting this size, they are as successful as any of the detailed plants I painted in the past. These plants are only as detailed as they need to be but they aren't thrown on randomly, without any thought. They have tone, colour and temperature. Some parts are in shadow, other parts in sunlight and they express the umbrella-like flatness of bracken ferns – and, although they sit against a very dark area, they are restrained enough to not steal attention from the rest of the painting. Those strokes were painted with one brush, about 1.5cm (3/4") wide. I placed the loaded brush flat on the surface and dragged it very slightly to make the main strokes. First the cool green shadow then the warm sunlit area. I used the corner of the brush to make the bright, specular highlights. In fact, I used two brushes of that size on this painting, one for the sunlit colours and one for the shadow tones. I used a slightly smaller one for some "detail" and, finally, I used a rigger for a few "grassy" strokes here and there. Most of what you see, however, was painted with the two larger brushes. The thin vertical strokes in the ferns were probably also painted with those large brushes as they are certainly capable of producing sharp lines. It is also possible, however, that I flicked those strokes on with a rigger. The thin, twiggy lines near the bottom are a combination of scratching with a satay stick and painting with the rigger. Wow you must be up early, it's 9:25 pm here in Spain that makes it 3:25 am in western Australia?! Anyway, I love your plein air oil paintings. Thanks for your comment. Your maths looks about right but I actually posted around midnight so it must have been a while before you saw it.